Can you hear it? The buzz around BlackBerry 10 is getting so loud that the carriers are beginning to respond. According to Peter Misek, an analyst with Jefferies & Company, carriers are starting to lock in volume commitments for BlackBerry 10 orders covering the first two quarters following the launch of the first BB10 model, expected to be the BlackBerry Z10. The all-touch model is penciled in to hit Canadian stores next month while a road map for T-Mobile showed a March 27th launch date for the device. After digging around, Jefferies has found that the build numbers for BlackBerry 10 have been raised sharply from the 500,000 per month figure that was leaked in early December. 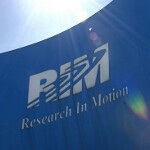 The latest research shows that RIM now plans on building 1 to 2 million units a month. The analyst also said that while RIM is counting on BlackBerry App World to host 70,000 apps when the first BlackBerry 10 model is released, his checks show that developers ares supporting the new OS more than Jefferies expected. According to the analyst, BlackBerry 10 will support secure corporate email services on iOS and Android. He believes that investors and other analysts are overlooking this major change. He also sees RIM beating earnings estimates for the March and August quarters as BlackBerry subscribers will finally have a "legitimate upgrade opportunity." So what's an investor with some extra dough in his pocket supposed to do? After raising his rating on RIM's shares from neutral on Friday, the analyst is recommending investors buy RIM. Misek also raised his target from $13 to $19.50. 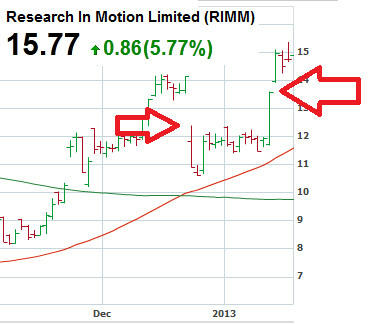 On Friday, RIM was trading at $15.64, up almost 5% on the day. The stock might never approach the $140 price it hit in 2008, but it is up more than twofold from the low it made under $7 back in the fall. Technicians see an "Island Reversal" in RIM's stock price which calls for higher prices ahead. That is something great to hear... Does that mean berry's got tons of pre-order for BB10 or Is this is to draw attention? I think it is to draw attention. Else, they'd end of with stocks of BB10 gadgets no one wants... Unlike Apple which has already lowered orders. I hope it works out for RIM. I'm bored with iOS and Android is still way too buggy. new OSes are way more buggy for sure. It's understandable when people switch for fresh experience which are likely not pleasant, just fresh. Seeing that iOS has it's bugs every New Years day you must be living on the corner of the moon. Android hasn't been buggy for me since the update to 4.0... I think you're just being silly. Yea but the rest of 95% of android owners don't or can't get android 4.0 . You can root your phone and lose features and functions with each rom. My photon will never see 4.0 and even if I managed root and a custom rom, I lose 4g. Lol I use 4g alot so much for for that idea. 95% is exaggeration. Last time I checked it was that around 27% of Android users were on 4.0, and there are probably a few more on it by now. That number should definitely increase within the next year or so, seeing as though almost every Android device coming out now is being released with 4.0 or 4.1, except for the lowest of the low end. And your Photon won't see 4.0 because of the Tegra 2 inside of it, which is a shame. There are only a couple devices with Tegra 2 that got updated, and there's a reason for that. Updates are important to you? Get a Nexus. That's been a given of the Android ecosystem for a while now. I can't see this not ending up on a massive failure, competition is ruthless. Upon RIM's announcement and media attention: Google - good for RIM and the whole smartphone playing field Apple - Bah! Did we mention the iPhone is now 4'?! Microsoft - Damn it! how come we couldnt do this??? I hope it doesn't come to that. Microsoft has a bigger chance at this. RIM on the other hand is betting on high end offerings. But chances are these two might go nect-to-neck in time. Which wins depends on which is in your pocket. Microsoft has a bigger chance? WP still is smaller than RIM's EVER been in marketshare, even with their down and out 2011 and 2012 years. I think its safe to say RIM is back, and will no doubt shoulder the 3rd place crown once again. Do Blackberry executives honestly believe thaey'll be able to move that many handsets at launch ?? i really think RIM can go back on top and BB10 will be the 3rd platform of choice.. why? coz most of the carriers around the world buzz about BB10 and the actual device! and also the ecosystem wont be a problem since android apps can work on BB10! devs just need to port them! even iOS apps could work on BB10 since android, iOS and BB10 are from same root, UNIX (linux is from UNIX) unlike WP, not all carrier are hitting it! they all wanted nokia device! but its just that the new nokia flagship miss some important points like microSD slot and WP's ecosystem isnt growing fast as it should be since its almost a 3 year old OS, its ecosystem need to be very decent(even though 100,000+ apps is decent but still)! and WP lacks costumization even though apple's iOS is also on that state but still need to be like WinMo coz that software is just awesome for me! one of a kind! (im still wondering why MSFT ditch it for their live tile-centric WP..coz some people consider this live tile-centric OS a disaster..but as for me, just a different experience, but not really buying it) if BB10 will really have 70,000 apps available for release, it will surely survive! but then again RIM needs to market it well! plan something that is flagship-ish but all people can afford it! even the average people! and that BB10 ecosystem will surely grow in no time since again it has this ability to have android apps on it... unlike WP, still stuck at 100,000+ apps, if its really growing and worth to be called as the 3rd ecosystem it should have own at least 15% of market share right now! and overtake the current "3rd"- the BB7 devices..but it didnt... i think BB people can easily adopt BB10 from BB7...thats why i think BB10 can really hit the 3rd spot! or maybe even overtake iOS if apple will keep its 2007's iOS looks with no "wow" factor on its UI! but back to WP, i might laugh so hard if MSFT cant grow with WP, WinRT/8 tablets, especially in WP, what if that jolla OS and ubuntu will be available (but lets just say jolla right now since ubuntu is still on 2014) and since its a linux and supports the QT platform, they might overtake MSFT! thats just a hilarious but sad tragic for microsoft and also for nokia! I have faith in BB10 and what it will bring to the marketplace. Let the competition be tough. BB10 will fail for sure. Pre order in Canada runs for around 800units now as per Rogers. Thats too small compare to Galaxy s3 or iphone 5 which shows in millions. When Galaxy s4, iphone 5s, Htc M7 comes out, i dont think they can survive. Goodluck! !